If there was ever a day to remember that in the world of Earth-based astronomy the weather is king, it was today. Heavy cloud and persistant rain made sure that this morning's Solar Eclipse was well and truly eclipsed, meaning to say that we and many others didn't see a thing. 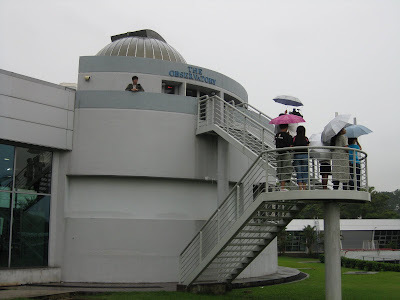 Despite the rain an estimated 300 or so optimistic visitors came to the observatory at 8:30am. As our motto says: The show must gone! Actually, we don't have a motto, but in cases such as this it seemed appropriate. With no eclipse and no live webcasts we did the only thing we could.......FAKE IT! 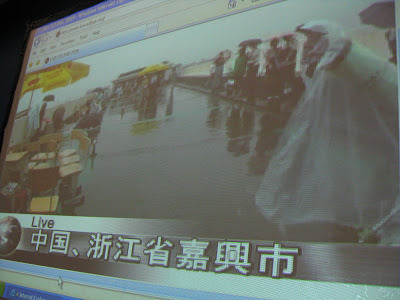 Now, when I say fake it, I don't mean use somebody's head and film it moving slowly in front of a bright light, no no no! I mean we used our trusty software Starry Night Pro Plus to show people an animation of what the eclipse would look like if there were clear skies. About 100 or so people stuck around for this "simulated eclipse" and a brief tour of the observatory. However, some were a little surprised when they saw just how small a 10% eclipse actually is and also that Singapore will not see a total solar eclipse until the year 2168. 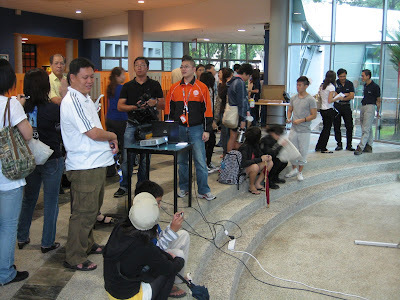 Above: Alfred setting up live webcast outside classroom. 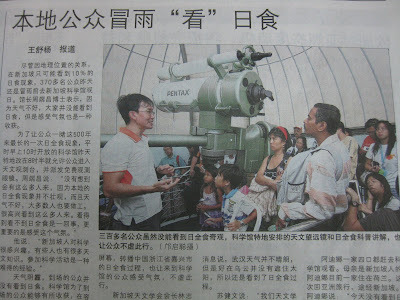 Above: Yong got his picture in the paper (Lianhe Zaobao) treating visitors to a tour and Q&A session at the main telescope.